Tiger Flower (Tigridia) - Bulbous plants with very showy flowers, not generally hardy. The best known species is T. Pavonia from Mexico, a plant of many forms and garden varieties, differing in shape or color from the parent, with its large flowers 5 inches across, glowing in scarlet and orange. 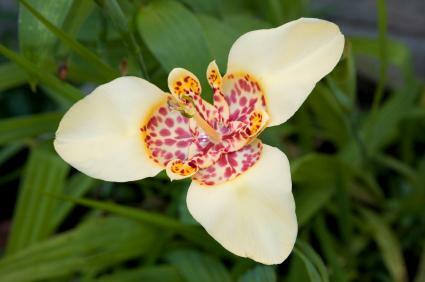 Tiger flowers require similar treatment to Gladiolus, though in some southern areas they grow in light soil and a warm position. Annual lifting, storing, and spring planting are needed, and the bulbs are better freed from the bulblets of the previous season. In warm gardens, where the bulbs are left in the ground all the winter, they should be well protected with ashes. Choose the sunniest spot in the garden. A sandy loam lightened by leaf-mould is the best to ensure a strong and rapid growth. From about midsummer onwards till September, or even later, the plants will be in bloom. In October the foliage turns yellow as the bulbs ripen; lift by November, bunch them, and hang in an airy shed till dry. Tigridia Pavonia var. Alba - Flowers nearly 6 inches across, with sepals and petals of ivory whiteness, heavily blotched at the bases with carmine-red. Tigridia P. A. Immaculata - This is a sport from alba, its name having reference to the uniform snowy whiteness of the flowers, which are without the conspicuous spots of other varieties. Though normally pure white, the flowers are sometimes tinted with pale green or creamy-yellow. Tigridia P. Aurea - A hybrid raised many years ago between T. Pavonia and T. conchiflora, and uniting the robust vigour of the first with the refinement and fine color of the second parent. The shade of yellow inclines to orange, and the small central basin of the flower is mottled with red, reddish-purple, or chocolate. The flowers are freely produced, and the plant is easy to grow and increases rapidly. It is better known on the continent than with us, and often under the name T. Watkinsoni. Other varieties are flava, with pale yellow flowers and a red-spotted centre; canariensis, a pale yellow from; lutea immaculata, soft yellow without spots; and carminea a new and pretty shade. Tigridia P. Conchiflora - Flowers with outer segments yellow, heavily blotched with red at the bases, and with inner segments similarly variegated. The names canariensis or conchiflora grandiflora probably represent a form differing slightly as regards brilliancy of color, but it is undoubtedly a seedling form of the original T. conchiflora. Though the small flowers of this kind are refined and beautiful, the plant is rather weakly, increases slowly, and is apt to perish. Tigridia P. Grandiflora - Flowers larger and brighter in color, with fuller and more rounded petals. Under this name I would also include the names speciosa, splendens, coccinea, and Wheeleri. Tigridia P. Lilacea - Flowers with rosy carmine sepals and petals, the bases variegated with white, a cross between T. Pavonia and T. Pavonia alba. Tigridia P. Rosea - Flowers with rose colored sepals and petals, the bases variegated with yellow, a cross between T. Pavonia and conchiflora. If there's a variety of Tigridia that suits your growing region, your local nursery should have it in stock each spring. If they do, give this beauty a try. It takes a little more cultivation than the average spring flower, but it is well worth the effort.